A. A virtual interface has not been configured. B. The interface configured for NetFlow has an incorrect bandwidth command configured. C. The NetFlow collector is on the same subnet as the router configured for NetFlow. D. The configuration of the NetFlow collector is incorrect. Q4. What is IP SLA’s default frequency for sending probes? Q5. In what configuration mode is the ip nbar protocol-discovery command issued? A. Configure an IP address on the interface. B. 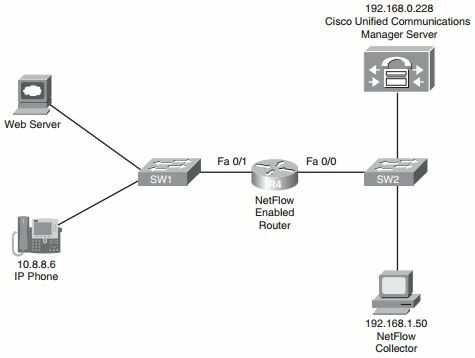 Enable Cisco Express Forwarding on the router. C. Configure the bandwidth command on the interface. D. Enable RSVP on the interface. Q7. What wireless network mode of operation is characterized by having the functions of a traditional wireless access point divided between a lightweight access point and a wireless LAN controller? Q9. What command can you use to display the VLANs that are permitted on the trunk ports of a switch? Q10. What interface configuration mode command can you enter in a Cisco Catalyst switch to instruct the interface to trust incoming DHCP markings?